E-MU XM7 passive speakers (black wood grain) reviewed using the Sound Blaster X7 (standard power supply) & the Marantz NR1606, as well as various other amps. Back when the Sound Blaster X7 was announced, the triangular desktop amp raised plenty of questions, not the least of which was, "what speakers would go best the X7?" The answer to that question is endlessly debatable, but the X7 does lend itself to certain characteristics. Passive, efficient bookshelf speakers make the most sense, and certainly the X7 is begging for a full-range design. 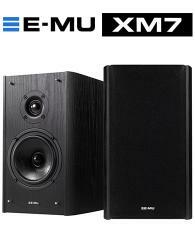 With the introduction of the E-MU XM7 bookshelf speakers, Creative has put forth their own candidate. The XM7 speakers bear many of the hallmarks of popular bookshelf speaker designs. There is the 5" woofer at the core, a 1" tweeter, and a rear port tube. These components come together in a hefty, magnetically shielded wooden, curved baffle enclosure that connects via binding posts and the included set of speaker wiring. The XM7 is available in both an all-black wood grain color and in light brown wood & metallic grey front finish. The XM7 is rated at a X7 LE friendly 60W max, and when used with the X7, special speaker settings are added to the X7 Control Panel. There are two ways to really consider the E-MU XM7. This first is as a passive bookshelf speaker that is expected to be as versatile in use and placement as the bookshelf speaker category suggests, and the second way is to consider the E-MU XM7 as paired with the Sound Blaster XM7. As an aside, the E-MU part of the name comes from the legendary synthesizer, sampler, and chip-maker that became part of Creative some 25 years ago. The name invokes a world of MIDI interfaces and studio monitors, but in practical terms, the listener needn't worry too much about the branding. Bookshelf speakers are meant to be multi-purpose and indeed, can be used in pairs or as a complimentary piece of a give listen environment, be it office, living room, bedroom, garage, etc. Over the past decade or so, however, bookshelf speakers of all sizes, makes, and prices, have exhibited a certain two-stage thinking. Anyone who wants respectable bass, will get likely have a sizable sub nearby. As such, low frequency response is often ignored or outright has been marginalized in many bookshelf speaker designs. So much for versatility. Worse, many bookshelf speakers have been designed and positioned so that the user buys them thinking they will be good main channel speakers, only to decide in time to move them to surround channels. One thing is for sure, the E-MU XM7 speakers are not back speakers masquerading as mains. They are clear, airy, and can hold their own when it comes to bass production. They can project powerful sound, and they're not diffuse. At roughly a foot tall, seven inches wide, and nine inches deep, these aren't the biggest bookshelf speakers on the market, but neither are they compact and out of the way. (More on that later.) The pairing of the 1 inch silk dome tweeter with the five inch polypropylene woofer suggests a buck in the trend of bigger woofers, but the big, enclosure has a nearly three inch rear-facing port tube. As a result, the XM7 needs some breathing room, a recommended six inch clearance in back. With that reasonable concession in place in a living room setting, the XM7s can do their thing. After trying a few a different amps (as well as the X7), I decided to pair the XM7s with the Marantz NR1606 for the bulk of my non X7 testing. I poured a lot of music through the speakers, and continued to do so well after a generous burn-in accounting. From the highly synthetic, like Kavinsky's 'Nightcall' from 'Drive,' to Clapton's 'Old Love,' and the occurring thoughts I had, were of clear and even sound. There are points when I thought the sound might flatten out, only to be surprised by the deep range. The bass response can alive, but not in a crushing ever-present way. The XM7's construction, its materials and heft, (like the rubber surround on the woofer) suggest quality in line with the price, but my suspicion is that the XM7's secret is its crossover, which while not perfect, is like to surprise the careful listener. Where music exhibits itself as part of other media, like in the opening of 'True Detective,' the XM7s continue their good work. Using the XM7s as the mains in a 5.1 set-up, I watched the first episode of 'The Wire,' and was caught by how well the speakers pick up on the show's many music cues. On the gaming side, I had the XM7s employed when I was poking around the 'Rare Replay, and that meant my return to the N64 classic 'Perfect Dark,' came through beautifully. It's crazy to have the sounds, the music, the effects, and the voice acting, that I knew by heart from some fifteen years ago, being played in a way that is stronger than I had ever heard before. After dipping quickly into 'Batman: Arkham Knight' to confirm that yes, the chatter about Bruce Wayne is still in effect, I decided to switch over to a different openworld audio power house, 'Grand Theft Auto V.' For me, Rockstar just has it nailed. Don Johnson's 'Looking for a Heartbeat' is only good for an extremely brief time, but winding up the northwest coast, and all of the sound comes together. The traffic, the water, the profane citizens- it's at one moment calm, and the next, full of pursuit vehicles. Ultimately, the worst thing I can say about the E-MU XM7 speakers is that a decent amp is required to get the speakers to exhibit their true capability. An entry level AVR is going to make the XM7s sound fine, but step up in class, and the speakers will come alive. While the XM7 does very well in a modern bookshelf/living room setting, the close association with the Sound Blaster X7 (review here) means the pairing is at least equally important. The X7 itself is positioned as a nice living room option, but it too must face the expectations of desk work. The X7 is small, and able to offload some of its hulk to its cabled power supply. Meanwhile, the XM7s are twenty pounds of speaker, whose primary application is at the computer desk. Creative even has a funny diagram about how to position the speakers for desk use. I say it's funny, because getting the 10 inch deep, 12 inch speakers into place can be tricky, but it's exactly what someone who is really getting enthused about sound would want to do. Positioning aside, it's not surprising that the X7 and XM7s, which work so well separately, come together so well. The X7 in its way, does suggest that a two channel desk is the way to go, and the XM7s are the full-range design that does 2.0 without comprising. Being so close to speakers, right in the sound axis, the typical listener is unlikely to have a more critical position in their home. Where the X7 is good at keeping PC sound clean, the XM7s come in and act like monitors. The X7 Control Panel has one special setting specific for XM7s. This setting allows the user to pick the tone, with Energetic (suggested for movies & games), Neutral (for monitoring), and Warm (non-monitor music) being the options. While these settings appear to be just kind of impure stuff that normally dazzles in stores but is better left untouched, in this case there is some merit. After all, the changes are meant to somewhat subtle and are specific to this equipment. While I did find some allure to Warm, I stuck with Neutral. Overall it's a more compelling feature than I expected, and I wouldn't be surprised to find as many listeners enjoying it as not. Firing up 'Akira' on Blu-ray, and the beginning 'Kaneda' section is alive and engrossing; it's nothing short of splendid as each musical strike with its wooden nuance is intercut with the revving engines and unbound motorcycle club antics. Jumping into 'The Witcher 3: Wild Hunt' (or loading in as it were), and again, the soundtrack (love that Qwent music) is my companion as I investigate Fyke Island. For a lark, I tried out the X7's Scout Mode in 'ARK: Survival Evolved,' which is something I would normally reserve for headphones. To my surprise, I started to enjoy the shift in focus as I tried to see how stealthy I could be and not die. Since the X7 is so adept at layering the sound of different sources together, it's fun to hear how the XM7s handle the Live version of Fever Ra's 'Dry and Dusty' as I trope about 'ARK's jungle. The speakers can handle the quietest growing echelons of notes that I can throw at them. They also can sustain being loud without losing composure. Don't at all be fooled by the double digit wattage numbers, the XM7s are rated honestly, and it shows. With performance and application so adroitly handled, what's left is mainly the look of the XM7s. The thin screens fit the tall baffled shape, and easily are freed via rubber caps that grip fixed metal posts on the speaker faces. The all black color choice suits me, though the brown/metallic choice does seem reminiscent of the three piece executive system that the X7 can appear as. Some focused light can reveal the secrets of the tweeter. The 5-way binding posts are similar to the ones on the X7, and like the X7, the XM7s come out of the box with their rubber feet in place. Even as bookshelf speaker, the XM7 in all-black is a little monolithic, and the front E-MU logo is tiny. I suppose they lack some visual flair, but honestly, they look like nice but unassuming speakers, which is what I tend to favor. The pricing of the XM7s can change dramatically if bought in a bundle (here) with either the Sound Blaster X7 or X7 LE, so that ought to be a consideration for buyers. Like the Creative flagship amp, the Sound Blaster X7, the E-MU XM7 doesn't mess about, and the speaker's performance can stand on its own. The physical footprint of the XM7s can be demanding, but it is worth the payoff. While the XM7s can appear niche, a lone speaker offering highly positioned to be paired with a certain amp, there is a commitment to a full-range design that works up-close and in a living room setting that is commendable. With such versatility, non X7 owners should take notice, and Creative ought to consider building a full line-up of E-MU XM speakers.